Take Exit 29 (Route 28/38). Stay Right off the exit towards Route 28N. At the 4th light take a Right onto Route 16E. Take the first exit on the Right towards Wellington T Station. Stay Right and circle back underneath Route 16 towards Revere Beach Parkway. Go Straight through the Stop sign. At the 6th light (end) take a Left on Main Street. Pine Banks Park will be on your Right approximately 1 mile. Turn Right into Park. Pitch is on far side behind baseball diamond. At the first stop sign, take a right onto Pond Street. Proceed through the intersection and follow Pond Street around the pond approximately 1 mile (stay in left lane). Take left turn at circular median and continue on Pond Street. Pond Street becomes W. Wyoming Ave. Proceed 3/4 mile down W. Wyoming. Turn Right on Main St. Proceed 1/2 mile. Pine Banks Park will be on the Left. Turn Left into Park. Pitch is on far side behind baseball diamond. Take the Orange Line to Oak Grove T Station. From the T, turn left after exiting the turnstiles. Walk left onto Banks Place (the first road you see). As the road bears right you will come to a set of traffic lights. Walk across the street straight through the traffic light into Pine Banks Park. 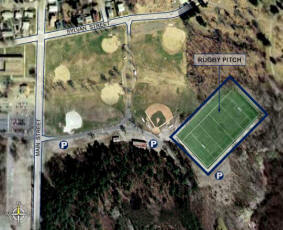 The rugby pitch is on the far side of the park behind the baseball diamond.